Most cat owners know about the narcotic effects catnip can have on cats. But the herb can also have a calming effect on humans. It makes a soothing and refreshing herbal tea. And it's easy to grow in pots or in the garden. 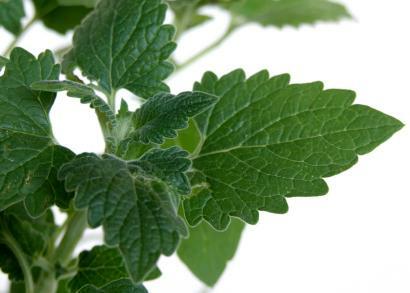 Catnip, Nepeta cataria, is a member of the mint family. The hardy perennial is native to Europe and Asia but has become naturalized across North America. Plants have sturdy stems with grey-green, heart-shaped leaves and produce white or lilac flowers. It grows about two feet tall. Catnip is so easy to grow that it is often found growing wild along railroad tracks and roads and in empty lots and fallow fields. You can easily start plants from seeds in pots or in the garden. If you do grow it in the garden and let it go to seed, you could have a garden full of it next year. Although catnip isn't too picky about where it grows, a rich soil in partial or full sun is best. Provide good air circulation around plants to avoid powdery mildew, a fungal disease to which this herb is particularly susceptible. Apart from occasional weeding and watering during drought, catnip requires almost no care. You may need to protect new plants until they are large enough to withstand a cat's abuse. Plantings will last for several years, provided the neighborhood cats let them. About two thirds of adult felines are genetically predisposed to the intoxicating effects of catnip. Cats will bite, eat, rub against, and roll in plants to release the volatile oil trapped in the leaves. The oil produces a harmless high, or friskiness, which only lasts a few minutes before the cat loses interest. Dried catnip should be stored in an airtight container to preserve its potency. You can easily make toys your cats will go wild over by stuffing old socks with the dried herb and tying them closed with a string. Catnip is non habit-forming and has no negative side effects. So why not grow kitty its own little pot of euphoria? Catnip has many medicinal properties. Fresh or dried leaves may be used to make a refreshing and therapeutic tea. The tea is high in vitamin C and has traditionally been used to treat such conditions as nervousness, insomnia, hyperactivity, colds, and fevers. The minty herb makes a calming bedtime tea for most people. But some respond to it as a stimulant instead. Try a little bit first to see how you react. Catnip may be used sparingly to add flavor in salads. The flowers make an interesting garnish. Oil of the herb has even shown to be an effective mosquito repellant. Harvest catnip in middle to late summer, just before plants flower. This is when essential oil production is at its peak. The herb is best picked in late morning after the dew on the leaves has dried. Air-dry plants in a well-ventilated area that is out of direct sunlight to preserve essential oils at their best. Nepeta grandiflora, Giant catmint, is lusher and more ornamental than true catnip. It has dark green leaves and dark bluish-purple flowers. Nepeta x faassenii is most commonly grown as an ornamental plant. This hybrid is smaller than Giant Catmint, with greyish-green leaves and flowers that are usually blue but also come in pink, lavender, and white. 'Blue Wonder' and 'Walkers Low' are popular cultivars. Many cats are also attracted to this species. Nepeta susessilis is another ornamental catmint with larger, dark green leaves. It produces clusters of deep blue flowers. Nepeta cataria 'Citriodora' is a lemon-scented cultivar.